It seems I have been permanently afflicted. Every time I see or hear the words "peanut butter and jelly," a certain little ditty pops into my head. What's worse is that it stays in my head...for hours. At least I know I'm not the only one to whom this happens. Other people are stuck on the the jingle as well. Needless to say, "it's peanut butter jelly time" ran through my mind constantly as I a) made these mini loaves, b) ate these mini loaves, and c) wrote about these mini loaves. Yes, it's peanut butter jelly time right now. Preheat oven to 350F and prepare baking apparatus. In a large bowl, whisk together the melted butter, peanut butter, eggs and milk until smooth. Add the dry ingredients and stir until just combined. Fill each mold in selected baking dish about halfway up with batter. Top each with a hearty helping of fruity spread and cover with remaining batter. I baked my mini-loaves for about 40 minutes, check muffins after 17-20 minutes, or just rely on the ol' toothpick test. i can't say it enough, i love you pics! this looks really good, i'll have to try it soon. Haha.....that must be sorta annoying? These loaves look great though! I'm not a huge fan of peanut butter and jelly sandwiches, but these loaves look really yummy! With that stuck in your head, what else could you do but make these loaves? ;) They look fantastic! I am a sucker for anything peanut butter! This is my comfort food! Ha ha ha ha, I'd never hear that ditty before! I always think of the song my kids brought home from pre-scool. Actually singing is probably the wrong word, more like repetitious yelling. And while I know PB&J is everyone's else's favorite, my mother always made peanut butter and honey sandwiches. Odd, I know, but I grew up loving it. Those are also adult-friendly ;-P! A yummy treat! I'm going to make these for the husband. He is a big kid! I don't know the ditty either, but I do like peanut butter...and jam. Nothing's more anoying than Hubby singing a jingle right before your head hits the pillow. He's goes fast to sleep while I have his ridiculous jingle running in my head! Your mini loaves look great, and I'd love to try these as muffins. This is just a perfect thing with pb and j all in the same place in a baked good. 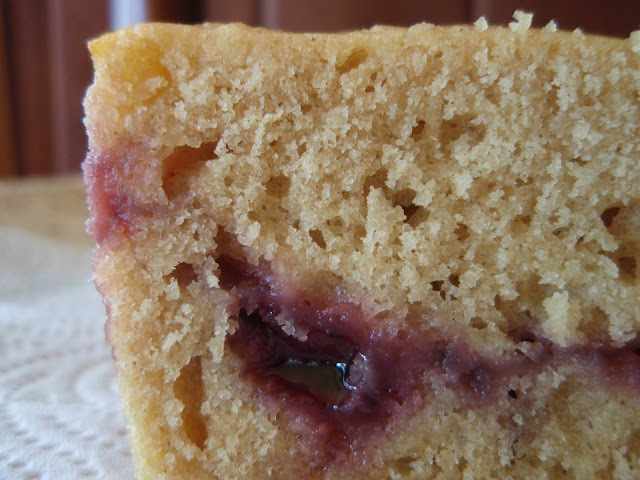 i love pb & j in cakes, pies, cookies, crumb cakes, english muffins, bread. but you know what i haven't tried? in a friggin pie. what do you think? Ha! I hate that song. The loaves look awesome though. Oooh - those look great. But, on behalf of most of your readers let me just say THANKS A LOT for putting that jingle back into my head!!!! So the question is, is it a good thing to have the jingle running through your head? Judging by the look of these muffins, I'd say it is definitely a good thing! This one has my approval too! Wow, P and J in a loaf format, loves it! V. cute idea, but would you believe I didn't grow up eating PB&J? PB with bananas in our house. But I'm married to a man who loves PB&J for snacks. I know he'd love this, too! This looks great, You know I love peanut butter, yum! Luckily, I forgive you because these mini-loaves look fab. We are a huge peanut butter and jelly family over here. My boys can barely get through a day without having it in some form or another. This looks like a great way to do something different with the combination. I will definitely be trying it! now those loaves looks beyond delicious!!! wow....wish i had one now! Nothing can be bad when you have peanut butter and jelly mentioned in words, recipes or songs! :) These loaves look divine! This looks delicious! I can't wait to try out this recipe! This is such an yummy treat! It looks super comforting! who doesn't love peanutbutter and jelly! I like to think that it's always PB+J time in my life. Or at least it will be once I make these loaves! They sound delicious! Now thanks to you I will be singing that song all day! I will be trying out these little jewels. Who does not love peanut butter? 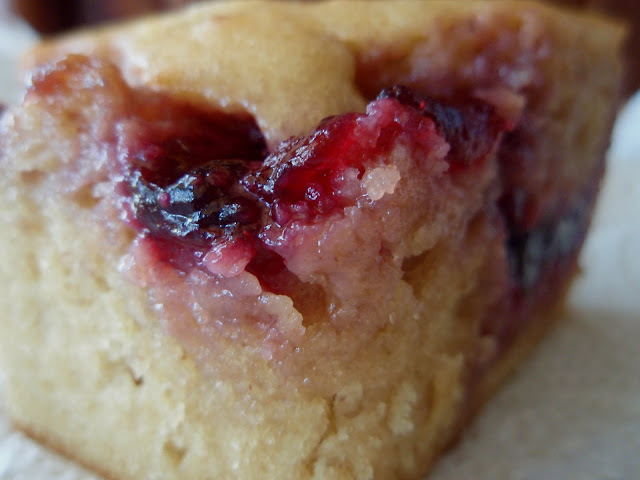 mmm... there's not much better than a good pb&j, besides turning it into a cute little loaf! That song! Argh! The loaves, however, look terrific! Anything featuring peanuts is an automatic win for me. And jelly, oh, now you're just being too much. P.S. I love too muchery. lol, I used to sit next to a fellow who brought PBJ sammies for breakfast every day and another co-worker would often bust that very tune out to wake us up... that miniloaf looks sweet! Adorable little loaves. Great for adults as well! I could most definitely go for a slice now as I am drinking my coffee. What a cute song to get stuck in your head, eh? My 4th son bought me a Mother's Day card which said words to the effect of If you think you're having a bad day, think of all the freakin PB&J sandwiches that octuplet chick is gonna have to make. If she used this bread, the sandwiches would already be made! I love the idea of these. I think I must make them very very soon. For some reason I have been craving pb recently! WOW. Talk about a novel take on a classic! Love it! I could even make it with tahini if I don't find the peanut butter up here (we are in the moutains) but I have seen it in Beirut supermarkets. This would be a big hit in my house, even with my pickiest eater. And now the peanut butter jelly time song is stuck in my head! This little loaves look so moist and tasty! What a fabulous idea! I make peanut butter bread for the 101 year old lady I sit with and I never thought of adding the jelly. What a great idea. I will have to try that the next time I make peanut butter bread. I also use crunchy peanut butter and I throw in the mix about 1/2 cup of roasted peanuts. Thankfully the jingle doesn't work unless you actually hear it else I'd be up the rest of the night instead of heading for nighty night. Although, the thought of those little gems may just keep me awake anyway. Your images are simply amazing, Grace. I'm positive a bite would send me overboard. Well, if having an obnoxiously catchy song stuck in your mind is the price to pay for this loaf, I'll go for it! OH now you've got me singing it but at least it got the Hamm's beer song out..
Grandson and I have had pbj sandwiches for lunch the last two days- it's a winning combination around here. The bread sounds absolutely delicious and I can't wait to try it! I'm not a huge peanut butter nut but this looks delicious! I can't wait until my little girl can have peanut butter so I can make this and share it with her! There's just something about peanut butter and jelly that one never out grows!! I have been known to eat a pb&j sammy on toast for dinner. Ok...maybe two. these little diddies sound wonderful! something about PB&J just takes you back to your childhood huh? oO I can always use new ways to indulge in my love of PB&J! You made these just for me!I love PB&J. When I was a school girl I took a PB&J or PB& Honey sandwich to school every day. If my mother tried to change things up by sneaking in a cheese or bologna sandwich, I sent it right back home.